Information about the Goundry family that lived in and around Grewelthorpe. Data taken from Parish registers, school records, memorial inscriptions [M.I.] and census records. Letter from Joseph Goundry July 2012. I am from Spennymoor, Co. Durham. There is a Mike Goundry who lives at Washington, Co. Durham, who has gone into great detail on the Goundry family . I think he reckons they all originated from Coundon (near Bishop Auckland), Co. Durham. You mentioned the Dean & Chapter pit on your website – my father worked there & also at other mines in the Ferryhill (Co. Durham) area. You can e-mail me or phone (0191 4142903) if I may possibly be of help. My Hannah Goundry was married twice, first to a Mr Thompson then to Gooza Goundry a miner from Dean and Chapter pit. They lived at Dean Bank Ferry Hill Co Durham. Hannah brought up three generations of children taking the first generation from the work house on the day of her wedding! (They may have been younger brothers and sisters) Hannah was active in her local Labour Party and had a strong sense of family and justice. The siblings left the area, one I think was a police officer in Kent (Eddie I think) My mother was one of 6, when one of her sisters died Hannah brought up her three children, (as well as other cousins). Can anyone prove any link with these Goundrys to the family in Grewelthorpe. If so please get in touch. In response to Paul. It is thought there is no link between his Hannah Goundry and the Goundrys of Grewelthorpe. Letter from Ann Simpson. Jan 2012 I am researching my family tree and I recently been loaned some old photographs belonging to one of the late Goundrys and also a bible that belonged to my Great Grandfather Joseph Goundry. Looking through the census’s he appears to have spent his younger life living with his grandfather at The Crown and Anchor at Middleton Tyas, but no sign of his parents. In the 1901 census he was by this time married to Minnie Jane and farming at Eppleby, Richmond. Then on the 1911 census they were living at North Tanfield,Bedale. 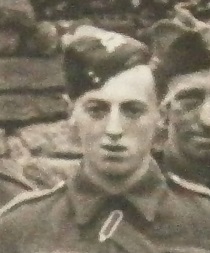 Their eldest son was John Goundry, my grandfather, the only photograph I have seen of him was in Army uniform [see below]. He was in Grewelthorpe British Legion up to his death. I was wondering if there may be some photograph’s of him in the British Legion archives some where. If you can help Ann with this research please contact this site. Sadly Ann died in 2019. If you can add anything to this page please contact me. DOROTHY GOUNDRY. Born 5.3.1924. Bap 20.4.1924.Grewelthorpe. Dau of John Wright Goundry & Hannah Thompson. ELIZABETH JOSEPHINE GOUNDRY. 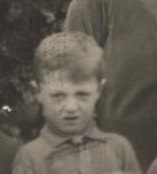 Born C1902. Dau of Joseph & Minnie Jane Wright. Married Fred Webster Bell. 1929. In this photo the lady next to the bride is Minnie Jane Goundry with possibly Joseph Goundry next to her. On her knee is Dorothy Goundry and kneeling in front of Dorothy is Billy Goundry. Thanks to Ann Simpson for this photo. Marriage of Elizabeth & Fred Webster Bell. in 1929. In 1930’s they lived Lunterstone in Dallowgill. ELSIE GOUNDRY [Nee Waite] Born 2 Dec 1923. Dau of Albert Waite & Martha of Galphay. Married to William Oliver Goundry the butcher. FLORENCE M. GOUNDRY. Born C. 1894 Middleton Tyas. Dau of Joseph & Minnie. HANNAH GOUNDRY [nee Thompson]. Born 16 Sept 1891. Died 26.9.1973. M.I. Wife of John Wright Goundry. 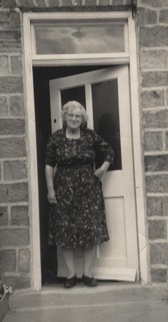 Hannah Goundry [nee Thompson] 1891-1973. Pictured outside Bellwood Farm. Grewelthorpe. ISABELLA GOUNDRY. Born C.1826 Brough Westmorland. Niece of Oliver & Elizabeth of Middleton Tyas. JANE GOUNDRY. Born C1834 East Layton. Dau of Oliver & Elizabeth of Middleton Tyas. JANET GOUNDRY. Born 7.11.1899 Melsonby. Dau of Joseph & Minnie Jane Wright. Married ? Thackray. listed as incapacitated in 1939 register. JOHN THOMAS GOUNDRY. Born 2.3.1934. Bap 22.4.1934 Grewelthorpe. Son of John Wright Goundry & Hannah Thompson. JOHN WRIGHT GOUNDRY. Born C. 1893. Middleton Tyas. Son of Joseph & Minnie Jane Wright. Died 27.1.1938. Grewelthorpe. M.I. Husband of Hannah Thompson. [see Thompson page]. Was the secretary of the Grewelthorpe branch of the British Legion. [see British Legion history page] Was elected onto Grewelthorpe Parish Council in 1937. He was made Vice Chairman and he was a school manager. Died 1938. Death notice in Leeds Mercury January 1938 JOHN WRIGHT, the beloved husband of Hannah GOUNDRY, Grewelthorpe, and the dear son of Joseph and Minnie Goundry—lnterment at St. James’ Church, Grewelthorpe. JOSEPH GOUNDRY. Born C 1741. Died 1790. Married to Mary Bulmer. JOSEPH GOUNDRY. Born C1838 East Layton. Son of Oliver & Elizabeth Alderson. of Middleton Tyas. JOSEPH GOUNDRY. Born C.1863.Middleton Tyas. Buried 22.6.1938. Grewelthorpe. M.I. Son of Mary. Grandson of Oliver & Elizabeth Alderson. Husband of Minnie Jane Wright. Nephew of William the Innkeeper Middleton Tyas. see obit at end. MARY GOUNDRY. Born C1841 East Layton. Dau of Oliver & Elizabeth Alderson. of Middleton Tyas. MINNIE JANE GOUNDRY [nee WRIGHT]. Born Oct 15 1867. Morton on Swale. Dau of J.Wright. of Gainford near Darlington. Died 19.12.1945 Grewelthorpe. M.I. Wife of Joseph. Lived Bellwood Cottage, Grewelthorpe. 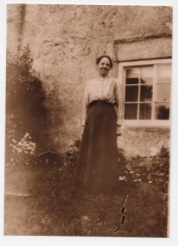 Minnie Jane Goundry outside her cottage. MINNIE GOUNDRY. Born C. 1897 Middleton Tyas. Dau of Joseph & Minnie Jane Wright. OLIVER GOUNDRY. Born C.1802 Barton. Died 1881. Son of Joseph & Mary Bulmer. Husband of Elizabeth Alderson. of East Layton. Innkeeper at Crown & Anchor Middleton Tyas. Widower in 1871. Died between 1881 & 1891. OLIVER GOUNDRY. Born C.1896 Middleton Tyas. Son of Joseph & Minnie Jane Wright. OLIVER W. GOUNDRY. Remembered on Kirkby Malzeard War memorial for WW1 fallen. WILLIAM GOUNDRY. Born C1842. East Layton. Died 1899. 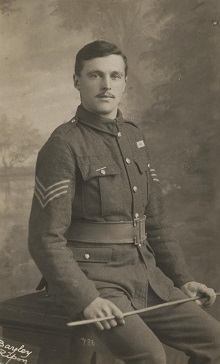 Son of Oliver of Barton & Elizabeth Alderson. Both men were Licensed Victuallers of The Crown & Anchor, Middleton Tyas. Husband of Mary Ann Gowling. born C1843. WILLIAM OLIVER GOUNDRY. Born 13.4.1920. Bap. 23.5.1920. Died 3.12.1995. M.I. Son of John Wright Goundry & Hannah Thompson. Husband of Elsie Waite. [Dau of Albert & Martha.] Butcher in Grewelthorpe. See photos. Billy Goundry at school. 1928. ……… Billy in WW2. 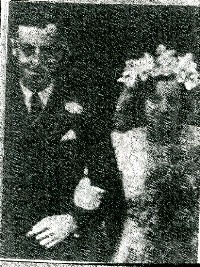 Wedding of William Oliver Goundry and Elsie Waite in 1946. The lady at the back is Dorothy Goundry in 1951. Obituary for Joseph Goundry. 1863-1978. Death announced of Joseph Goundry age 75 of Bellwood Cottage Grewelthorpe. He was an ardent worker for the cause of Methodism. He had been a Sunday School teacher and Superintendant for over 50 years. He was also a local preacher for 24years. A native of Middleton Tyas, Richmond. He commenced his farming career in Darlington district coming to Beck Meetings Farm over 30 years ago. From there to Gate Bridge Mill and he retired to Grewelthorpe 15 years ago. He leaves a widow, 3 daughters . 2 Sons and a daughter having pre deceased him. 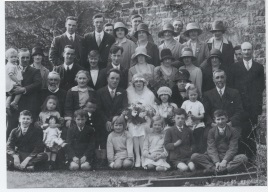 Funeral in Grewelthorpe 30.6.1938. Billy Goundry. Butcher in Grewelthorpe. Lived at Burn Brae. Had shop near to Crown Inn.